Producers at the EPIX channel, the folks producing and airing this year’s Road to the NHL Winter Classic, have released the preview clip of the series today. It’s the first of many to come, we hope, and it’s a beaut. On the surface it may just look like a father, mother and son’s first family trip to the National Zoo, but it’s very much more, as Coach Trotz makes clear in the first few moments. For those unaware, Barry and Kim Trotz have four children. (The Post’s Alex Prewitt has an amazing profile of the family here and you are commanded to read it.) Our take from when Trotz was named bench boss is here. The youngest, Nolan at 13, was born with Down syndrome. Which means, among many other things, that the only home Nolan has only ever known was Nashville, Tennessee. Moving a family after years in one location is wrenching enough; it can be even harder on children with special needs. 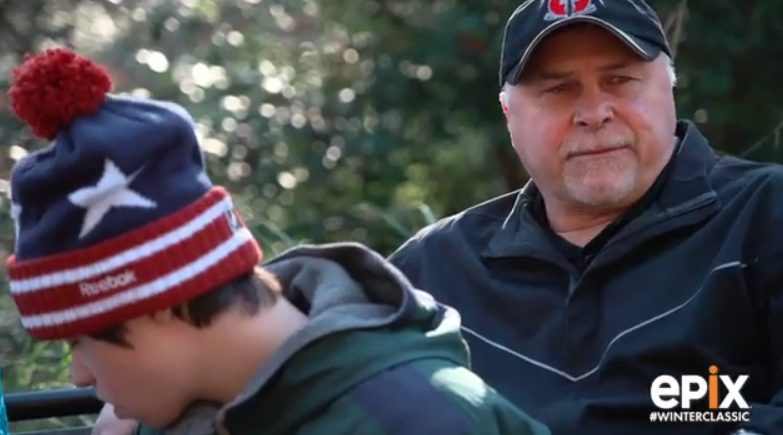 “He was sort of a lightning rod for our family,” Trotz says in voice over as the family take a wintery visit to the zoo. “I used to be hockey, hockey, hockey, hockey hockey. Before I was probably a lot more controlling; I wanted to control everybody, and everything. And I realized you can’t,” he tells the camera. One of the things we value the most about these Road to the Classic series is how it lets us enter the private lives of those we watch so publicly. A few years back, we loved watching Coach Boudreau and his boys Andrew and Brady head to Tyson’s to pick out a Christmas gift, or argue with Haagen-Daaz, we’re still not quite sure. This is obviously a very different moment in some ways. But perhaps in the ways that matter most, it’s very much the same: father and son, enjoying the day in each other’s company. Nothing more basic than that. This entry was posted in Winter Classic 2015 and tagged Barry Trotz, Bruce Boudreau, EPIX, Haagen-Daaz, Nolan Trotz, Road to the Classic. Bookmark the permalink.